The last couple of months have had me limping along in pain. In my left heel. Sometimes excruciatingly painful. It’s almost like walking on a bad bruise. I have investigated this pain. And come to the conclusion that it is a classic case of plantar fasciitis – again. This nasty condition had appeared in a different spot on the same foot a few years previously. The orthopod I was going to worked her magic and it resolved. I was advised to wear shoes with good quality arch support. Which I have done ever since. And do foot exercises. Which have been a bit less diligent. So why has it now recurred, but in the heel? I put it down to my knee on the same side. It suddenly flared up and has had me limping ever since. Admittedly it is much better but I need to be very careful. Aged knees and arthritis do not go well together. I know my gait has changed because of it. So, the ligament in my foot that goes from the heel to the arch has become inflamed. A classic case of the domino effect. My mission now is to get it back under control. I have assorted lotions and potions to deal with the inflammation and pain. If all else fails, I have heavy duty prescription stuff. We have bought a new lounge suite with recliners so I can elevate the legs. So comfy. 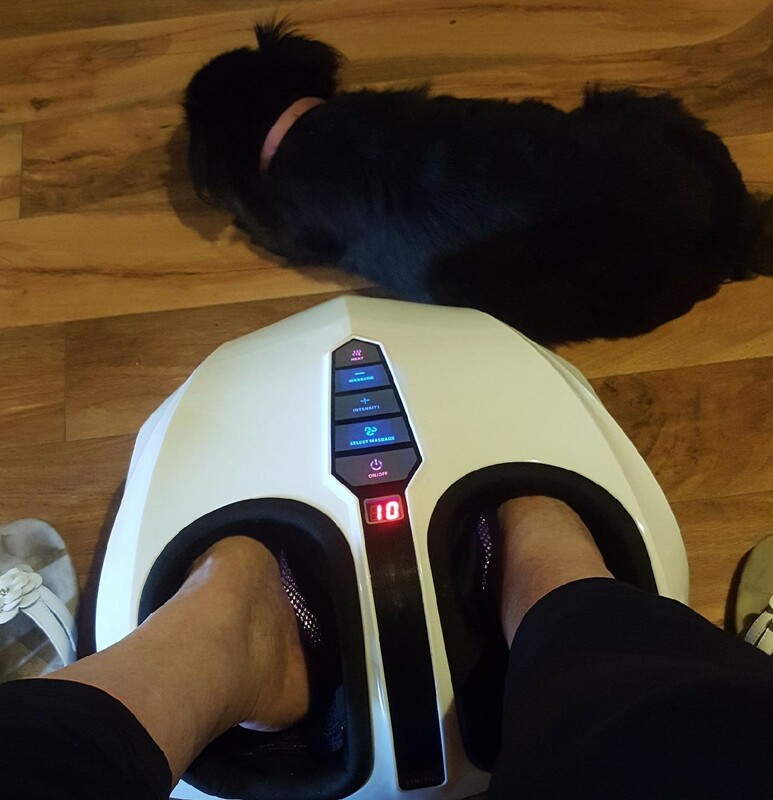 And just this week a friend lent me this shiatsu air compression foot massager. So twice a day I sit for 15 minutes having the soles of my feet rolled and the foot compressed. It’s not for the faint hearted, but I do believe it is starting to make a difference. thank you for sharing this therapy. i pray it works for you. Hey Raili – my wife was crippled with that a few years back. It was agony and she could hardly walk. My daughter bought her a TENS machine and the transformation was almost immediate. It was almost magical – well worth the money. It IS incredibly painful. Gee that machine sounds like magic. , will have to look into it, Opher. Thanks. I’ve heard of that, and very painful it sounds. I do hope you find a cure, and that you’ll soon be walking normally again. It is unplesant to the least. Prayers for you.